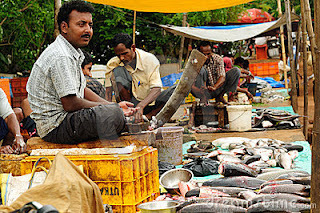 Here is an interesting tale of savings from a fish-seller I have known for quite some time. His reliance on informal savings is interesting as it has helped him supplement not only his livelihood but also enhance it further. Earlier, this year, he bought a house worth Rs 24 Lakh. Pandiarajan or Pandi as most people know him is a 31 year old fish-seller in one of the suburban fish-markets of Chennai (he receives a monthly salary and runs the shop on behalf of the owner). He has been the bread-winner of his family from the age of 14 when his father deserted the family owing to his problems with drugs and alcohol. Pandi is the eldest of 4 kids - 2 boys and 2 girls. His job as a fish-seller is the 3rd job in his life and he has previously worked as a computer technician, an assistant in a vegetable market and then as a salesperson in a famous retail outlet in T Nagar. Having worked in the fish market for 14 years, he opened his first savings account only 5 years ago. So the obvious question was how did this young man save his money? Pandi's first stint into any kind of savings scheme was in the form of a chit fund in the year he entered the fish market. It was 1998 and he joined a 20 member chit fund group for the value of Rs 30,000. The reason why he did this was to pay advance amount for the house where he was staying (at that time) with his mom and siblings. He came to know about this chit fund from a neighbour. Till date, Pandi is still a member of a few chit funds within the city. Subsequently, Pandi also began to avail himself of informal loans that allowed him to pay on a daily basis. For example: Pandi's first loan was an amount of Rs 10,000. He received Rs 9,000 in hand as Rs 1,000 was considered an interest amount. For the next 100 days, Pandi would pay the person Rs 100 per day. Surprisingly, when I refer to this as a loan, Pandi says its not a loan, its interest. He still continues with this scheme today and his average loan amount is Rs 50,000. The highest loan amount he has availed till date is Rs 1,00,000 and that too he has paid in full within 100 days. So how did Pandi use the money he received from chit funds and this informal source(s)? Pandi began to buy gold (once every three months) for his mother and sisters. From time to time, he would pawn some amount of the gold for his household as well as business expenditure. In 2008, using the gold investments and a few loans, he bought a car and started a travels/call-taxi business. Pandi and his younger brother shared the responsibility of driving the vehicle. Pandi recalls this event well because a well-known bank refused him a loan (to buy the vehicle) as he did not have any collateral or wealth. However, Pandi was able to pay back his informal loans now that he had two income sources. In 2010, he bought a second car to further his travels business. "They are very document as well as procedure oriented"
"Any transaction with respect to a bank is time-consuming and time is a huge asset for me who relies on daily transactions to make a living"
"They did not grant me a loan for a vehicle which I wanted to use to generate an alternate income. Their reason being I did not have any form of collateral"
"I have to spend a lot of time in cleaning myself and making myself presentable so that people at the bank do not complain about any smell. Despite this, they do not treat me with any form of respect. There is some amount of social stigma against fish-selling people"
"I know the bank is meant to help people and I respect their service. However, I feel they are more interested in serving high-income clients/rich people"
"The best thing about banks in recent years is the introduction of the ATM machine as it reduces the chance to meet bank staff to some extent"
Five years ago, Pandi did open a savings account in a rather popular National Bank. He did this upon the insistence of a relative. How did this help Pandi? Pandi did nothing apart from regularly deposit money in this account (monthly basis). Owing to zero indulgence in temptation goods (citing his father as an example), Pandi deposited whatever excess amount he had in the bank whenever he can. He did this on a monthly basis and at times on a quarterly basis to limit the number of bank visits. He ensured that he never touched this savings deposit so that he could use it for a big purpose some day. He did not have a clear cut goal but he knew such an amount would come in handy. On hearing his story, I asked Pandi whether he is perturbed on having so many debts. Pandi says he does not see it that way. He works hard and has multiple sources of income. If he plans it well and lives life with some discipline, he can do it. He does not maintain any accounts books to plan things and it is all about mental accounting. On being asked about his journey so far, Pandi laughs at the question and says he is rather looking forward. Pandi does have plans for the future. He has opened a fish stall on his own away from the market and plans to operate that alone once he has cleared his debts from the purchases of the new house (the rent from three flats gives him Rs 9,000 per month). Pandi's only regret happens to be that he could not study further than the 10th grade. He wanted to study more and was a good student in academics. However, he does stand proud on what he has achieved so far. He adds to the social stigma factor - his marriage has not happened till date as his occupation has served as a reason for rejection. But Pandi believes, he will overcome this obstacle soon as well. Is Pandi's story an exception among the poor? Can it be replicated? Has the formal financial institution really understood the customer? Can formal and informal savings mechanisms co-exist? Should they? I really liked this example of smart use of loan to built up asset - I think will be difficult to generalize for others to replicate as it requires great amount of planning and discipline!